Many ITS applications in work zones serve a combination of the above purposes. Information, tools, and resources on FHWA's Every Day Counts Smarter Work Zone Technology Applications Initiative. Comparative Analysis Report: The Benefits of Using Intelligent Transportation Systems in Work Zones (HTML, PDF 1.5MB) - Provides insights into the mobility and safety benefits of using ITS for work zone traffic management, as well as tips, and lessons learned. The information presented is based on an FHWA study that examined five case study sites: I-40 outside Winston-Salem in North Carolina; I-30 between Benton and Little Rock in Arkansas; US-131 in Kalamazoo, Michigan; I-35 in Hillsboro, Texas; and DC-295 in Washington, DC. Benefits of Using Intelligent Transportation Systems in Work Zones: A Summary Report (HTML, PDF 810KB) - Summarizes the results of a quantifiable assessment of the effectiveness of ITS in work zones, as well as tips and lessons learned. Five sites participated in the study: I-40 outside Winston-Salem in North Carolina; I-30 between Benton and Little Rock in Arkansas; US-131 in Kalamazoo, Michigan; I-35 in Hillsboro, Texas; and DC-295 in Washington, DC. Intelligent Transportation Systems in Work Zones: A Cross-Cutting Study (HTML, PDF 2.8MB) - Examines how transportation departments in Illinois, Michigan, New Mexico, and Arkansas used ITS in their work zones to monitor and manage traffic, including providing traveler information and enhancing incident response. Information covered includes why the systems were selected, design and operational characteristics, any issues/lessons learned, and the benefits derived from using the systems. Informed Motorists, Fewer Crashes: Using Intelligent Transportation Systems in Work Zones - Brochure that examines the safety and mobility benefits of the use of ITS in work zones. The brochure quotes elected officials and transportation professionals from around the country about the benefits they have experienced from using ITS in work zones. Mitigating Work Zone Safety and Mobility Challenges through Intelligent Transportation Systems: Case Studies (HTML, PDF 2.5MB) - Describes how five sites used ITS to mitigate work zone safety and mobility issues and illustrates how to apply a systems engineering-based decision-making process to designing, selecting, and implementing a system. Criteria for Portable ATIS in Work Zones: Lane Merge, Travel Time and Speed Advisory Systems (PDF 774KB) - Compares 16 different portable advanced traveler information systems (ATIS) devices in 27 separate deployments throughout the United States. The study recommends an 11-step procedure whereby traffic engineers can choose the most appropriate ATIS configuration for a work zone. Development and Field Demonstration of DSRC-Based V2I Traffic Information System for the Work Zone (PDF 609KB) - University of Minnesota report that examines the architecture, functionality, and field demonstration of a dedicated short range communication (DSRC)-based Vehicle to Infrastructure (V2I) communication system that can be used to improve traffic efficiency and safety in work zones. The field demonstration showed that the developed system can adapt to changing work zone environments smoothly under various congestion patterns. Evaluation of Work Zone Speed Advisory System (WZSAS) - Evaluates the effectiveness of a WZSAS and its applicability as a traffic management tool. A WZSAS provides en route traveler information to advise drivers of traffic speeds in advance of diversion points upstream of a work zone, encouraging them to divert to alternate routes when the work zone is congested. The Concept of a Smart Drum Speed Warning System - Presentation from January 2007 TRB Annual Meeting Human Factors Workshop on Work Zone Safety: Problems and Countermeasures. FHWA Case Study: Real-Time Work Zone Traffic Control System (HTML, PDF 221KB) - Using an Automated Traffic Information System to Reduce Congestion and Improve Safety During Reconstruction of the I-55 Lake Springfield Bridge in Illinois. Dynamic Lane Merge Systems(DLMS) - These systems use dynamic electronic signs and other special devices to control vehicle merging at the approach to lane closures. FHWA Case Study: Dynamic Lane Merge System (HTML, PDF 243KB) - Reducing Aggressive Driving and Optimizing Throughput at Work Zone Merges in Michigan. Florida DOT - Evaluation of Safety and Operational Effectiveness of Dynamic Lane Merge System (PDF 1.6MB) - Presents the specifications, cost, and evaluation results for a simplified DLMS (both early merge and late merge applications), as well as a literature search on DLMS and other work zone ITS. Minnesota DOT - Evaluation of the 2004 Dynamic Late Merge System (PDF 8.3MB) - Evaluates the deployment of a DLMS at three locations in the Minneapolis/St. Paul metropolitan area. Merge Control Techniques in Work Zones - Early and Late Merge Systems (PDF 1.5MB) - Presentation from American Road and Transportation Builders Association 2004 National Work Zone Conference. Merge Management at Work Zones - Presentation from January 2007 TRB Annual Meeting Human Factors Workshop on Work Zone Safety: Problems and Countermeasures. Speed Management Systems - There are a variety of technologies that can be used to help manage and enforce speed limits in work zones, including Variable Speed Limit (VSL) systems, automated enforcement, radar, and speed advisory systems. Portable, Non-Intrusive Advance Warning Devices for Work Zones With or Without Flag Operators - Minnesota DOT study to develop a work zone alert system informing speeding drivers of the upcoming work zone and raising their attention level before they reach the taper line and/or the work zone flag operator. Research Pays Off: Automated Speed Enforcement Slows Down Drivers in Work Zones (PDF 1.4MB) - Describes Illinois DOT's successful speed-radar photo enforcement (SPE) program in highway work zones and the benefits that have been recognized from the program. Aggressive law enforcement, including the use of SPE vans, in conjunction with educational campaigns and improvements to work zone traffic control, have reduced work zone fatalities from a high of 44 in 2003 to 31 in 2009. Evaluation of the Effectiveness of a Variable Advisory Speed Systems on Queue Mitigation in Work Zones (PDF 1.9MB) - Study evaluating the use of Variable Advisory Speed Systems (VASS) to reduce queue length at a work zone entrances. Speed Photo-Radar Enforcement Evaluation in Illinois Work Zones (PDF 2MB) - Presents the results of a study to evaluate the effects of an automated Speed Photo-radar Enforcement (SPE) system on the speed of vehicles in highway work zones. SPE effects were also compared to other speed management techniques, including speed display trailers and police presence. Maryland SafeZones Program - Describes program that places automated speed enforcement technology in Maryland work zones to encourage drivers to travel at safer speeds. Work Zone Variable Speed Limit Systems: Effectiveness and System Design Issues (PDF 451KB) - Virginia Transportation Research Council report evaluating the potential of VSL systems to enhance mobility and safety in heavily traveled work zones. The results indicated that VSL could create substantial improvements in traffic operations if the demand did not drastically exceed capacity. Speed Management Information Resources - Searchable collection of resources on speed management topics/applications, including in work zones. Safe Speeds in Work Zones (HTML, PDF 481KB) - Describes work zone speed display technologies that can be used to help manage safe speeds and provides example applications. Variable Speed Limit Signs Effects on Speed and Speed Variation in Work Zones (PDF 4.4MB) - Describes the results of research done to test driver response to VSL technology in a Utah work zone. Field Operational Tests On Variable Speed Limits In Work Zones (PDF 159KB ) - Describes the results of field tests carried out in Michigan to implement and analyze the effectiveness of VSL in work zones. The following links are abstracts to papers included in TRB's Transportation Research Record: Journal of the Transportation Research Board, No. 2015. Copies of the papers are available for purchase from TRB. Radar Speed Display (PDF 591KB) - Evaluates the effectiveness of radar actuated speed displays in several contexts. D-25 Speed Advisory System (PDF 457KB) - Evaluates the D-25 Speed Advisory Sign System, which is intended to warn drivers of stopped or slow-moving traffic ahead to enable them to reduce their speeds and avoid rear-end crashes. Presentations from January 2007 TRB Annual Meeting Human Factors Workshop on Work Zone Safety: Problems and Countermeasures. Washington State DOT Speed Enforcement Cameras Pilot - Pilot project conducted by the Washington State Department of Transportation (WSDOT) from September 2008 to June 2009 to determine how well speed enforcement cameras can slow work zone traffic to improve safety for workers, drivers and their passengers. Subsequently, the legislature granted an extension to June 30, 2011. Portable Changeable Message Sign Handbook - Presents basic guidelines for the use of PCMS. Development of Hybrid Dedicated Short Range Communication- Portable Changeable Message Signs Information Systems for Snowplow Operations and Work Zones - University of Minnesota Center for Transportation Studies report that explains a traffic-information system for work zone and snow plow operations that combines dedicated short-range communication (DSRC) technology and portable changeable message signs (PCMS) to communicate with all approaching drivers to improve traffic mobility and driver safety. Recommended Messages for Truck-Mounted Changeable Message Signs During Mobile Operations (PDF 1.7MB) - Describes research to develop guidance for Wyoming DOT on applicable situations and appropriate messages for use on truck-mounted changeable message signs during mobile work zone operations. Guidelines and recommended phrases and messages are organized by type of work, road type, and concerns being addressed. "Can You Read Me Now? Portable Message Signs Keep Drivers Informed" (PDF 11.9MB) - Article, on page 17 of Volume 42, No. 2 of the Texas Transportation Researcher, describing research being done by the Texas Transportation Institute (TTI) to assist field personnel in selecting and using proper PCMS messages in work zones. Advanced Notification Messages and Use of Sequential Portable Changeable Message Signs in Work Zones (PDF 1.3MB) - Presents the results of a study to identify and prioritize research gaps that still exist regarding the effective use of PCMS in work zones, and details the results of human factors studies to address the gaps. Development of a Field Guide for PCMS Use in Work Zones (PDF 706KB) - Discusses the development of a field guide for PCMS use in work zones, provides a summary and critique of available national and state-level standards and guidance on PCMS use, and describes the components included in the field guide and implementation considerations for deployment. Improved Work Zone PCMS Usage (PDF 1.9MB) - Describes research done by the Texas Transportation Institute to develop specific, user-friendly implementation guidelines that assist field personnel in selecting and using proper PCMS messages in work zones. I-35 in Central Texas - The Texas Department of Transportation (TxDOT) is using ITS as part of a construction traveler information system along I-35 in the Waco District to provide motorists with travel time information for the 90-mile stretch of roadway that is being converted from four to six lanes. Dynamic message signs have been installed to let motorists know how long it will take to get to specific destinations along the route. This is the first phase in providing advanced traveler information along the route. Future phases will incorporate information about construction delays resulting from lane closures. The travel time information is obtained through sensors placed at 40 locations along the interstate. Information will also be posted to the I-35 web site and provided through social media channels. The I-35 system will eventually connect to other ITS systems across the state to provide statewide traveler information. Once the I-35 project is finished in 2017, TxDOT plans to maintain the sensors to help manage traffic along the I-35 corridor. I-15 CORE in Utah County, Utah - The Utah Department of Transportation (UDOT) worked with contractors to develop an innovative approach to provide real time arterial traffic information during the I-15 Corridor Expansion (I-15 CORE) project and minimize delays for local motorists. This involved installing a monitoring system along nearby arterial routes, which uses anonymous vehicle data obtained from travel time detectors to measure actual traffic flow conditions. UDOT's Traffic Operations Center collects and analyzes the data, then updates and displays current travel time information every six minutes on variable message signs along the I-15 corridor and the I-15 CORE web site to provide motorists with current information comparing local road travel times versus freeway travel times. Motorists are directed to take the least congested routes – either I-15 or the state road US-89, leading to a reduction in delays, stops, emissions, and the number and severity of traffic incidents. I-93 in Salem, New Hampshire - The New Hampshire Department of Transportation (NHDOT) is using ITS extensively during the reconstruction of a 20 mile portion of I-93 from Salem to Manchester. ITS has been used at Exits 1, 3 and 5 as part of individual Smart Work Zones. 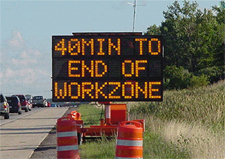 NHDOT is now beginning the implementation of a corridor-wide Smart Work Zone system. Phase I will install a number of devices such as variable speed limit (VSL) signs, cameras, variable message signs (VMS) and Roadway Weather Information Systems (RWIS), as well as communication devices to help relay the information back the NHDOT's Transportation Management Center. This system will be used during construction and remain in place post-construction to help manage traffic. "In Case of Fire: Technology Helps Clear a Path for First Responders" - Article in January 2011 issue of Roads & Bridges, Volume: 49 Number: 1, by Arthur Schurr, describing the successful use of an ITS-based Emergency Vehicle Conflict Warning System (EVCWS) during the replacement of the Brighton Road Bridge over I-376 near Pittsburgh, PA. The EVCWS enabled emergency vehicles to have quick access to the work zone and nearby areas by allowing them to avoid a detour and safely enter the road from the opposite direction, A siren-activated system detected the emergency vehicle and activated changeable message signs to alert drivers that an emergency vehicle was about to cross the roadway. Dynamic Work Zone Traffic Management - May 2010 ITE Journal article that describes how the Oregon DOT is using smart work zone technology to increase safety and provide motorists with work zone delay and travel time information, as well as to collect real-time traffic data for work zone traffic management during construction. Smarter Work Zones: Alternative Funding for Work Zone ITS Fact Sheet (HTML, PDF 344KB) - This fact sheet focuses on the Illinois Department of Transportation's (IDOT) use of Highway Safety Improvement Program (HSIP) funds to deploy technology applications in work zones. Guidance on Using Traffic Management Centers for Work Zone Management (HTML, PDF 1.6MB) - This document presents guidance for DOTs to consider how Traffic Management Center (TMC) resources (staff, data, and tools) can be used to support all stages of a work zone, providing examples of where these resources are used today. A total of eight strategies are presented for utilizing TMC resources during the four stages of a work zone. Each strategy includes detailed descriptions and examples of use in practice. Work Zone Intelligent Transportation Systems Implementation Guide (HTML, PDF 1.8MB) - The purpose of this document is to provide guidance on implementing ITS in work zones to assist public agencies, design and construction firms, and industry, including developers, manufacturers, distributors, packagers, and providers of devices, systems, and programs. Work zone ITS is one possible operational strategy of many potential solutions that an agency can include in a transportation management plan (TMP). Washington State DOT (WSDOT) Work Zone ITS Resource - Includes a history of work zone ITS use in WSDOT, an overview of devices and applications used nationally and by WSDOT, how WSDOT addresses work zone ITS in its design manual, and information on a travel time demonstration project. ITS Safety and Mobility Solutions: Improving Travel Through America's Work Zones (PDF 8.3MB) - Booklet developed by ATSSA ITS Council describing various ITS applications for work zones and potential benefits, considerations for use, and system layouts. ITS Benefits, Costs, Deployment and Lessons Learned: 2008 Update (PDF 7MB) - Synthesizes evaluation findings from across the country and around the world, providing verified data on the benefits, costs, deployment levels, and lessons learned about ITS. Work zones are covered in the Roadway Operations and Maintenance chapter. ITS for Work Zones Leaflet: Deployment Benefits and Lessons Learned - Summarizes the benefits, costs, extent of deployment, and lessons learned about using ITS in work zones. AASHTO Technology Implementation Group (TIG) - ITS in Work Zones - Provides resources, case studies, and other information on specific ITS in work zones technologies. Benefits of Work Zone ITS Discussed in FHWA Workshops - Link to article in FHWA Research & Technology Transporter - May 2006. Minnesota IWZ Toolbox: "Guideline for IWZ System Selection" - 2008 Edition (PDF 2MB) - The IWZ Toolbox has been prepared as a guideline for selecting an appropriate IWZ System for existing work zone traffic issues and to mitigate anticipated issues on scheduled projects. Smart Work Zone Deployment Initiative - A public/private partnership between the sponsoring public transportation agencies, private technology providers and university transportation researchers that deploys and evaluates technologies used to enhance work zone safety and traffic control. New Technologies for Smart Work Zones - Two presentations from American Road and Transportation Builders Association 2004 National Work Zone Conference. NCHRP Report 560: Guide to Contracting ITS Projects (PDF 883KB) - Provides guidance on the procurement of ITS, including variable message signs, traffic detectors, signal controllers, and a variety of other hardware and software that entail application of advanced electronics and information management to regulate and facilitate traffic flow. The report highlights best practices and recommends contracting strategies and contract types, terms, and conditions for ITS development, integration, system acceptance, warranty, maintenance, and upgrade. ITS Library - Contains documents on ITS topics published or sponsored by the USDOT. ITS Peer to Peer Program - Provides public sector transportation stakeholders with a convenient method to tap into the growing knowledge base of ITS experience receive short-term assistance. Insurance Institute for Highway Safety Web Site on Speed Management - Provides resources related to speed management and automated enforcement. PPT files can be viewed with the Microsoft PowerPoint Viewer. DOC files can be viewed with the Microsoft Word Viewer. WMV files can be viewed with the Windows Media Player.